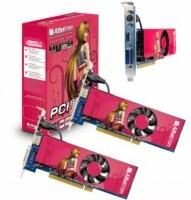 July 9, 2008 – Albatron Technology recently unveiled three new „PCI“ graphics cards at Computex 2008. You read it right – „PCI“ and not „PCI Express“! 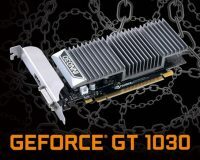 The PCI8600GT-256X, the PCI8500GT-256X and the PCI8400GS-256 are all VGAs that retrofit recent GeForce 8 Series graphics onto older PCI technology. These cards all offer a significant graphics boost along with dual monitor capabilities for an entire generation of integrated-graphics, PCI-only mainboards. It’s a little known fact that there have been millions of Mainboards mass produced in the last 7 years with AGP and PCI Express slots left off in favor of integrated graphics only. Although these mainboards have the traditional PCI-slots, they have been deprived of a chance to upgrade to the latest graphics technology which is almost exclusively for PCI Express these days. The best alternative to experience the latest graphics was for a complete systems overhaul – that is, until now. Albatron has answered the call with its PCI based VGA cards featuring recent NVIDIA GeForce 8 Series graphics technology. These cards allow these mainboards a chance to make a significant jump from integrated graphics without investing time and money in a whole new system. Add in a PCI graphics card, add on 2nd, 3rd or 4th monitor! As mentioned, these PCI graphics cards, with their multiple video adapters, can allow a system, with an integrated GFX mainboard, to configure dual monitors. But it can also give single-PCIe-VGA mainboards (can do up to 2 monitors only) a chance to add on a third or fourth monitor – who needs it you say? You’d be surprised at how you can make use of the extra real estate when you have 3 or 4 monitors. There are applications that can make use of more than 2 monitors such as flight simulation and tracking multiple stock exchanges. But from a more practical perspective, imagine watching a DVD in one screen, browsing the internet in another and doing your work on a third, all without shuffling between overlapping pages or searching your task bar for a program that you have open. Most recent VGA cards can get you dual monitors at best, but add on that third monitor with a PCI graphics card and you’ve got one very wide virtual panel. 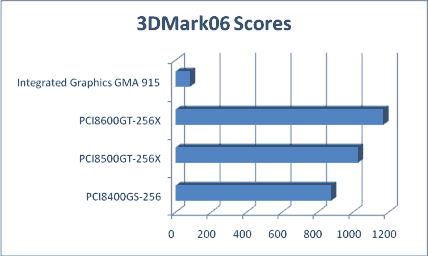 Integrated Graphics vs. PCI 8 Series Graphics – It’s all in the numbers! Preliminary tests have the PCI 8 Series VGA cards significantly outperforming Integrated Graphics by up to 1329%, according to 3DMark2006 scores. The tests in the chart above were performed on an Intel 915G MB testing the 3 PCI cards separately and testing once with integrated graphics only – CPU Pentium-4 520 (2.8 GHz), DDRII 800 1GB, Windows XP. These cards are all low-profile cards that make them easily adaptable to smaller cases. The PCI8600GT and PCI8500GT additionally boost performance with DDR III memory and come with HDMI connectors. All three cards come with DVI and TV-Out connectors. Integrated graphics mainboards without AGP/PCIe slots are the misfits of the new graphics age, severely limited in graphics upgrade options. However, the fact remains, that these boards are still capable, sturdy and abundant in large numbers. Albatron’s PCI 8 Series VGA cards come to the rescue with three great new cards that allow for an effortless upgrade with great savings!